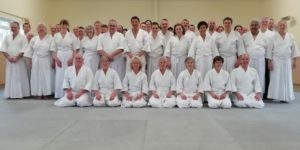 Sensei Mark Telford started practising Ki Aikido in 1997 and opened Sarum Club in 2009. All are welcome to come along to watch a class, please do call for access as if you are travelling by car you will need to press the intercom at the gates in order to be let in. Having studied Karate and Taekwondo Sensei Vince Picton finally found Aikido. Having been surprised by it’s effectiveness during a self-defence class Vince decided to spend some time trying to master the vast array of movements, become more relaxed and train his mind using the principles of Ki Aikido. After many years training in 2008 he took over as Sensei of the St Albans club. We practice every Sunday from 4pm to 6pm (with a few exceptions), please check first here. Everyone is welcome regardless of ability or gender. We give you the tools to improve your life, you use them to hone your experience every day. We’re a friendly bunch, come along and see for yourself. Classes are suitable for all levels of fitness and may be practiced equally by men and women of any ability, from age 12 years upwards.